The CargoPod is dropping off food hampers in Greenwich, London. Filmers and photographers line the street, their fingers hovering over camera shutter buttons. "Any second now," an engineer mutters nearby, eyes glued to a smartphone screen tracking the truck's location. The group collectively takes a deep breath and then, suddenly, the CargoPod glides into view. It rounds the corner silently before drifting up an empty boulevard and into a nearby side-street. The van's arrival is, to be honest, a little anticlimactic. With its small cockpit and large, boxy back, it resembles a milk float from the early 1960s, rather than a cutting-edge piece of autonomous transportation. Still, looks can be deceiving. 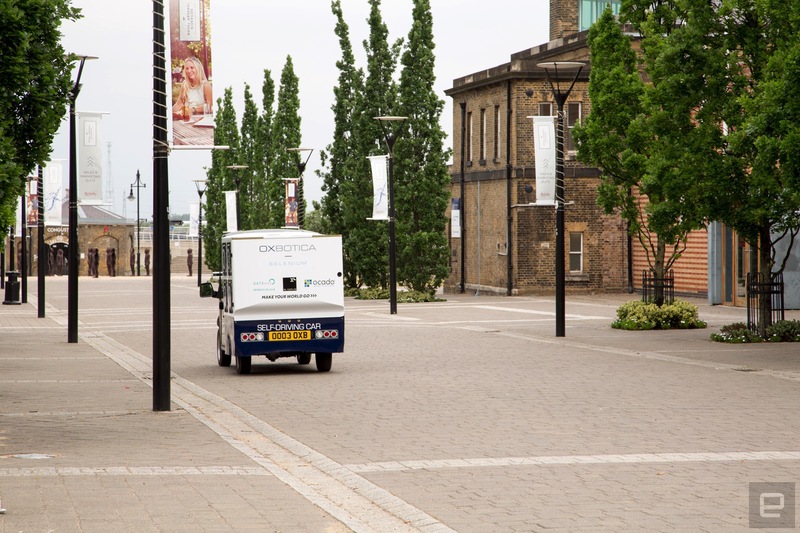 For the last two weeks, the CargoPod has been delivering groceries to the Royal Arsenal Riverside neighbourhood in Greenwich, London. It's been developed by Ocado, an online supermarket in the UK, and Oxbotica, a startup specialising in self-driving technology. The trial is limited in scope, however; participating customers can choose from just three food hampers, which include healthy treats, movie snacks or indulgent nibbles. All of the hampers are free, which is great for the residents, but they don't reflect the breadth and volume of products that Ocado usually delivers. Nevertheless, it's an important proof of concept for the company. "The (customers) have been very excited," Alexandru Voica, head of technology communications at Ocado Technology said. "Initially it was the draw of getting groceries delivered to them as part of a special project. But when they found out it was a self-driving vehicle, they were actually very keen to understand what that means for them, and also what it means for the future of transportation." Orders are loaded into the CargoPod at a nearby depot. There are eight containers on the back which can hold up to 128KG of groceries and allow the vehicle to stop at multiple destinations during the same trip. Once the goods are onboard, a driver manually steers the van to a starting location, where it's then flipped into autonomous mode. When the CargoPod arrives at your home, a light will illuminate around the numbered hatch which contains your order. You then have to press a button, which unlocks the "pod" door and a heavy-duty basket with the hamper inside. On a quiet Tuesday morning, a swarm of press are able to watch the truck in action. As the vehicle completes its pre-determined route, we take turns walking up and retrieving the bags inside. It all feels a little silly, in particular because there's an emergency driver inside the cockpit. Before I get close to the button, he clambers out and stands on the roadside, ready to help with the delivery. I open the hatch and he takes out the basket, handing over the hamper with a smile. I appreciate the service, but as a customer it defeats some of the purpose of a fully autonomous delivery. Still, the potential is obvious. In the not too distant future, your weekly food shop could be dropped off by a fleet of self-driving robots. 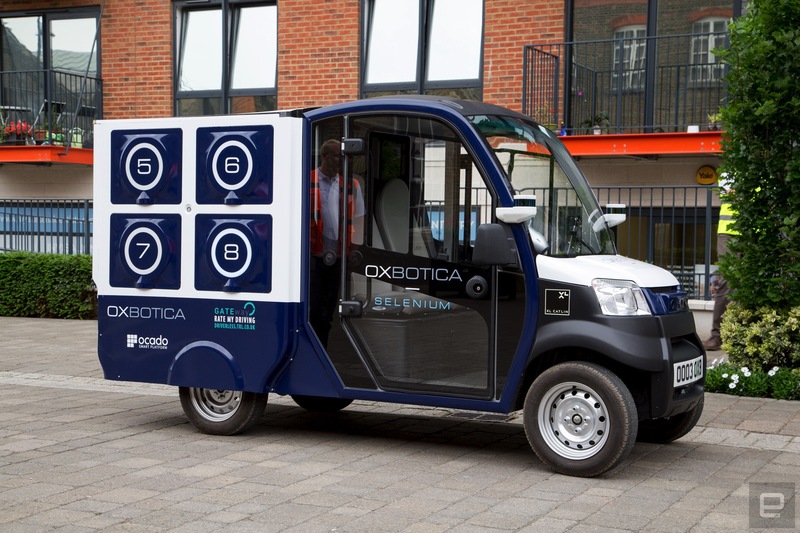 Oxbotica built the CargoPod using an "off the shelf" electric car platform. To make it autonomous, the team added cameras to the front and back and two sets of LIDAR — the laser based equivalent of radar — just above the wing mirrors. Together, these sensors detect and visualise everything around the truck, including cars, pedestrians and lamp posts. Notably, there's no GPS on board. "We don't use GPS in any of our solutions because it's not reliable enough for the environments we work in," Graeme Smith, CEO of Oxbotica explains. "So we use cameras to help us map a route. For example, you won't see this type of area mapped in any great detail, by any third party, so we use cameras to map the route and then in real time, we use the onboard cameras to localise and help us follow that route." The CargoPod is powered by Selenium, an autonomous operating system developed by Oxbotica. It handles minute-to-minute visualisation and decision-making: where the vehicle is, what's nearby and what it should do next. The system works with Caesium, a cloud-based platform (also developed by Oxbotica) that can manage and coordinate fleets of autonomous vehicles. For the two-week trial in Greenwich, it's been linked with Ocado's back-end logistics software, planning and updating CargoPod delivery routes. Caesium, can however, be used for other purposes too, such as public transport and Uber-style ride-hailing services. Oxbotica is exploring these areas in other driverless car trials. It was involved in the Lutz Pathfinder project, which ran for 18 months and tested small, four-wheeled pods in Milton Keynes. The team is also working on the Gateway shuttles ferrying passengers around North Greenwich. The CargoPod is just a prototype. A final version would, for instance, require a keypad or some form of verification system to stop orders from being stolen mid-route. For now, Ocado and Oxbotica are content delivering orders in a safe, controlled environment. Each trip produces valuable data which they can later analyse and use to improve the system. "At the moment our system is working 95 percent of the time," Smith says. "We always have a safety engineer in the car who can take control if we have to drive around an unexpected obstacle. But what we're trying to do is collect lots of data so we understand more about the environment and [the] unique and quirky incidents that happen around us." Ocado isn't the only one interested in the technology. Uber's autonomous trucking division, Otto, has already completed a 120-mile beer run across the United States. (Otto's future is unclear following a messy legal dispute with Alphabet's Waymo division, however.) Amazon and Google are rumored to be exploring similar vehicles too. The advantages are obvious: removing the driver could make deliveries cheaper, faster and safer for other motorists and pedestrians. Trucks can also carry larger, heavier loads than drones, which many — especially Amazon — are testing as quick, traffic avoiding and countryside-mastering delivery tools. For Ocado, the technology is part of a larger business strategy. The company sells a "smart platform" which gives other companies access to its delivery infrastructure — the technology behind its apps, its warehouses and delivery vehicles. As an online-only supermarket, Ocado has spent a lot of time and money developing these components. Now, it wants other businesses to take advantage of that expertise. Automated deliveries might be a few years off, but the company is keen to invest in the technology now so it can offer the option to clients at the earliest opportunity. "We like to think of ourselves as a mix of a retailer and a technology company," Voica said, "so we develop most of our solutions in-house, whether that's robotics, machine learning, or the kind of project you're seeing here today. All of these solutions will give us a competitive advantage as we enable others to use our smart platform. So it's very important for us to keep innovating and to keep doing exciting technology projects, because that will give us a competitive advantage going forward." It's a sensible bet, I think, as the CargoPod makes a U-turn and vanishes from view. Like a tap, the camera flashes stop and a strange silence returns to the street. It'll be back in half an hour to make another delivery, an engineer explains. I nod, sit down and tear into a packet of chips left in one of the hampers, happy to wait for another glimpse of the future.